You are at:Home»LGBT»Bruce Jenner, the transition that shocked the world? Bruce Jenner who now goes by the name Caitlyn Jenner might seem like a hero to many transgender people within the LGBT community. He probably is. 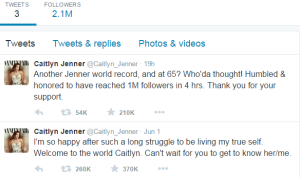 Caitlyn Jenner (Bruce) joined Twitter and his first tweet went out at 01:52AM 02 June 2015 and he set a new record beating the President of the United State Barack Obama as the fastest person to amass 1 million followers. Now for those who lived under a rock somewhere between 1976 till today, Caitlyn Jenner (Bruce) came to international stardom by winning gold medal in the decathlon in the 1976 Summer Olympics in Montreal, and went on to have an acting career in TV. Now we have come to know him in a reality series that came to screen from 2007 Keeping Up With The Kardashian led by his then wife Kris Jenner, the matriarch and ex-wife of the man who successfully represented OJ Simpson in his murder trial, Robert Kardashian (1978 – 1991). Amid much fanfare in a hotly anticipated interview then Bruce Jenner disclosed to Dianne that for all intents and purposes “I am a woman” and has been cross dressing since the early eighties and including being on hormone replacement therapy to transition into a woman. However further disclosing that he only stopped the treatment when he met the mother of his two daughters Kris Jenner in the early 1990s. After taking to the micro-blogging site Twitter, revealing his (her) new highly anticipated image and a new name, Caitlyn Jenner (Bruce) send out only 3 tweets. His first tweet was his Vanity Fair cover revealing a glowing and obviously highly air-brushed photo dressed in a white basque from Trashy Lingerie, second tweet welcoming Caitlyn to the world and his third just an expression of amazement at 1 million + Twitter followers within a short space of time. There is two ways that this Caitlyn Jenner (Bruce) will benefit the LGBT community, and not both positive. on the positive side this will afford the world at large the opportunity to bear witness to what a person can go through in life with internal crisis about their own image and how they identify themselves. It will help many young and old alike, marginalised individuals to have the courage to whither the storm of discrimination and be able to tell and live their own truth. However let us not forget that Caitlyn Jenner (Bruce) comes from the same fame hungry Kardashian family, with Kim Kardashian rising to fame after the release of her adult movie with R&B singer and brother to Brandy, Ray Jay. Therefore some people who are generaly homophobic might just view this as another attention seeking stunt with the sole purpose of generating lucrative deals from the reality show KUWTK and any of the spin-off from this current transitioning story. Because many are already questioning the validity of his “truth” based on the fact that he is 65 years old, had been married and has grown kids. The big question is do we stand any position to doubt someone else’s truth, or do we just accept what we are told on the basis that everyone has a right to their own individuality, and therefore we shouldn’t criticize people based on our own predisposed believes and religious believes? Why should we care anyway? Caitlyn Jenner already has an endorsement from the highest office in the world with President Barack Obama tweeting that “It takes courage to share your story” from his @BarackObama Twitter account and the tweet has been retweeted more than 40k times. More words of encouragement came from celebrities likes Maria Shriver, Kerry Washington, Lady Gaga, Demi Moore, Sam Smith, Josh Groban and lots more. It would be safe to say Bruce will safely transition into Caitlyn in the safety of celebrities as opposed to if he lived somewhere in an African community or other countries where homosexuality is still a crime. Caitlyn Jenner will also make his red carpet debut when he will be receiving the Arthur Ashe Award for Courage at the ESPY on the 15th of July 2015. Same award was given to the likes of Muhammad Ali back in 1997 and South Africa’s first democratic president Nelson Mandela in 2009. 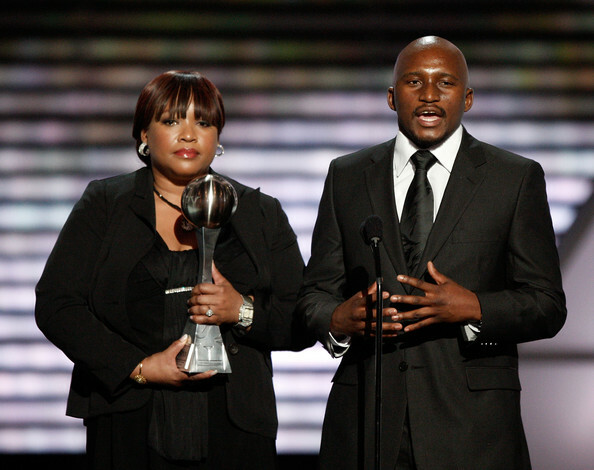 However Caitlyn Jenner would not be the most recent LGBT award beneficiary as it was also conferred to Michael Sam in 2014 for being the first publicly gay player to be drafted in the NFL. At the end of the day this is a story about bravery and truth. What is your truth? Next Article LG G5 – Get ready to play.